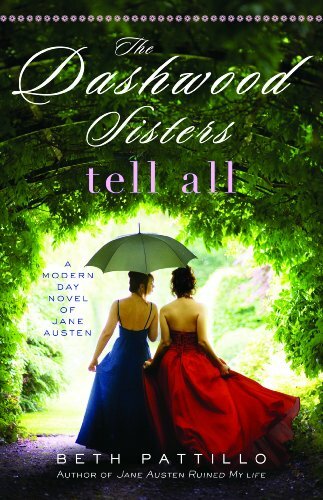 If you didn't catch it earlier in the week, see my review of The Dashwood Sisters Tell All. And then tell me you don't want to read it. I will not believe you! I LOVE these Jane Austen-themed book by Beth Patillo and I am happy to announce that the third in the series - The Dashwood Sisters Tell All , of course - has now been officially released! Furthermore, I am very happy to say that I have a copy of this new title to give away to one of you - as promised - courtesy of Ideals Publications (a Guideposts Company)! In order to win . . . ? THIS CONTEST IS NOW CLOSED. THE WINNER IS #10 - BLUEROSE. CONGRATS! Happy April Fool's Day! This book looks really interesting ~ please enter me. Thank you for hosting this and have a wonderful weekend! If I've never read Jane Austen would I enjoy it? (If not, you don't have to enter me into the giveaway. I know there are some here that would LOVE this book.) And if I wanted to begin to read Jane Austen, which would you suggest? And I'm a follower on Facebook! I'm really excited to read this one, so I would love to be entered. This looks SO fantastic! Thank you for this amazing day of giveaways! I would really like to win "The Dashwood Sisters Tell All." I enjoyed the other books I've read by Beth Patillo. Every time you review one of these, I think, "I really need to get started on these books." So I'd love to win this one! OO! I really want this one! I would love to read The Dashwood Sisters Tell All :) *Thanks* for the giveaway! I would love to read this...Thank you for doing this. I posted this on my Blog.. I'm definitely interested in this book after reading your review about it. I think Beth Pattillo is great! I would love to win a copy!! OK, Carrie, you've got me super curious about this book. Sign me up, please! fun looking book. Thank you. I "liked" your page on Facebook! I would love to be entered to win "The Dashwood Sisters"
I'd really enjoy this! Thanks! Oh, please enter me into the giveaway. Thanks! @ Annette W. - I'd suggest one of Jane Austen's more popular works, such as "Pride and Prejudice," "Sense and Sensibility," or "Emma." The writing is very different from today --some people find it difficult to get through, but what helped for me was that PBS had been playing the BBC miniseries adaptations of Jane Austen's books, so it helped to watch those as I read (I found it hard to keep track of some minor or semi-main characters at times). This book sounds interesting --thank you for the chance to win! I enjoy Jane Austin so I'd really like to read this book. It would be great for summer reading. I enjoyed the one P & P spin-off novel I've read, so sign me up! Count me in. I definitely want to read this one! I would love to read this book. The cover is so pretty. Please enter me. Thanks! Definitely going to read these! !